Sitting on my couch after a 12 hour work day (yay, job) eating *er* drinking my dinner and catching up on my DVR shows, namely The Best Thing I Ever Ate on Food Network. For those not familiar with the show, the program format is simple: Food Network chefs talk in a one-on-one interview style about...wait for it....the best thing they'd ever eaten. This episode, paired with a Great Lakes Holy Moses, centered around the best "Bang For The Buck" the celeb chefs ever ate. I found a bit of irony in the idea of celeb chefs discussing value at restaurants - chefs who have NYC apartments rent that is more than my annual salary. But it also got me thinking about one of favorite local restaurants who fits the "bang for your buck" bill: Cleveland's AMP 150 restaurant located inside the Marriott hotel. Seriously, they understand "bang for your buck" better than most. They describe themselves as a rock and roll restaurant (get the name? *AMP* 150) featuring "modern American cuisine, built upon foundations of flavor, freshness, and innovation....serving tasty selections all priced under $20." AMP 150 is a standard in my restaurant repertoire in Cleveland. The team meets my three food commandments every time 1.) exception service 2.) absurdly hilarious banter with customers and 3.) fantastic food (some items are sourced from a small garden in behind the hotel!) Chef Jeff Jarrett, who recently took over as Executive Chef when former EC Ellis Cooley headed back to Florida, is a seasoned pro with notches in his belt from DANTE, Lockkeepers and North Side in Hudson. If you haven't been to AMP 150 in Cleveland, consider this the best "Bang For Your Buck" special event in town. Goose Islands Vintage Ale line and select wines will be paired with 7 courses of food on Sunday, August 28. For my craft beer aficionados, the Vintage Ale line is stilled brewed in Chicago. The Smackdown is August 28th at 6:00 P.M.
Ready for the "bang for your buck" part? The cost is $50.00. Yes. Fifty bucks for a seven course dinner including beer / wine pairings with each course. Only way to get a seat is RSVP'ing via email here. I am a fan of beer. By "fan", I mean, I don't home-brew (I rent my home, folks) nor do I possess the ability to describe a beer's "drinkability" (that's a pseudo verb which I find hilarious). I'm intrigued by Goose Island as they begin to expand operations post-acquisition by Anheuser-Busch. Goose Island began as a brew pub on Chicago’s North side in 1988. Goose Island's most popular product, 312, is available in nearly every gastropub in the Midwest. Now it’s one of the fastest-growing small breweries in the U.S. since being acquired by Anheuser-Busch in March 2011. The brewery has gotten some bad PR recently, as they shift brewing operations for a few beers to outside Chicagoland. Maybe it's because I just returned from a trip to Chicago last week that I'm feeling some love for their hometown brewery gone commercial. 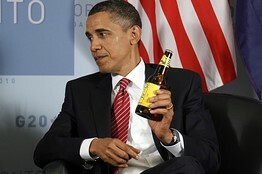 Maybe it's because Obama is a fan of Goose Island. The Goose Island Beer and Wine Smackdown is August 28th at 6:00 P.M.and is the first of their new series of events happening last Sunday of the month. Goose Islands Vintage Ale line and select wines will be paired with 7 courses. The cost is $50.00 and includes all 7 courses of food and alcohol. AMP 150 has provided me with two complementary seats to the Goose Island Beer and Wine Smack Down. I'd totally offer you the other ticket but this event is going to be pretty popular and I don't want to see any smackdowns before the event. I suggest you snag a seat yourself by emailing Nate here. There are only 20 seats. Bang bang. I am bummed when a brewery goes corporate.